Certainly an Autumnal day here with heavy showers driving through on a brisk wind. The air pressure reading of 984.8 hPa earlier today was the lowest in September since 2012 and the 6th lowest for the month in the past 50 years. The weather today has reflected it too with a few gusts over 40 mph and frequent blustery showers. The lowest pressure I've recorded in September ( since 1964) was 979.7 hPa on the 19th in 1981. Warning out for tomorrow with gusts possibly touching 65mph going by the latest GFS. With trees in full leaf still I can see a fair few being up rooted. Storm Aileen is expected to bring very strong winds with gusts of 50-60 mph on Tuesday night and into Wednesday morning. 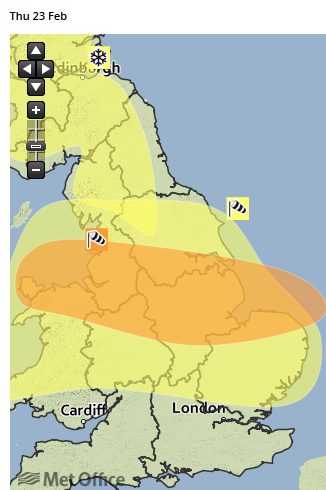 The worst of the winds, with gusts to 65-75 mph, are expected to be across North Wales, southern parts of Northern England, the North Midlands and Norfolk, for which area a separate Amber warning is being issued. Longer journey times by road, rail and air are likely, with restrictions on roads and bridges. There is also a chance of power cuts, and damage to trees and perhaps buildings. Along windward-facing coasts, some wave overtopping is possible." Me too, P.M.I can't remember the last time this area had an amber warning for gales- we'll see what happens. Looking forward to seeing what tonight/tomorrow morning brings as long as everyone stays safe of course! Could be very interesting for north Midlands such as Stafford upwards who will bear the brunt. I'm about 20 miles south of Stafford so I'm still expecting a few strong gusts but I don't expect any trees coming down! You're right, I'd forgotten is was as recent as that. Had a mean speed of 53 mph and a gust of 80 mph at 340 mts that day. If it's as strong as that tonight there could well be some tree damage as they're still in full leaf. Rain just touching here now. A gust of 68 mph early this morning was the highest in September since I started continuous wind speed records 20 years ago. No damage as far as I can see but a lot of leaves and small sticks lying in the roads. Thunder heard to the south of here during mid afternoon was only the third day this year with thunder. The fewest thunder days in a year over the last 40 years was 7 in 1978 and 1995 so that particular record could be under threat this year. 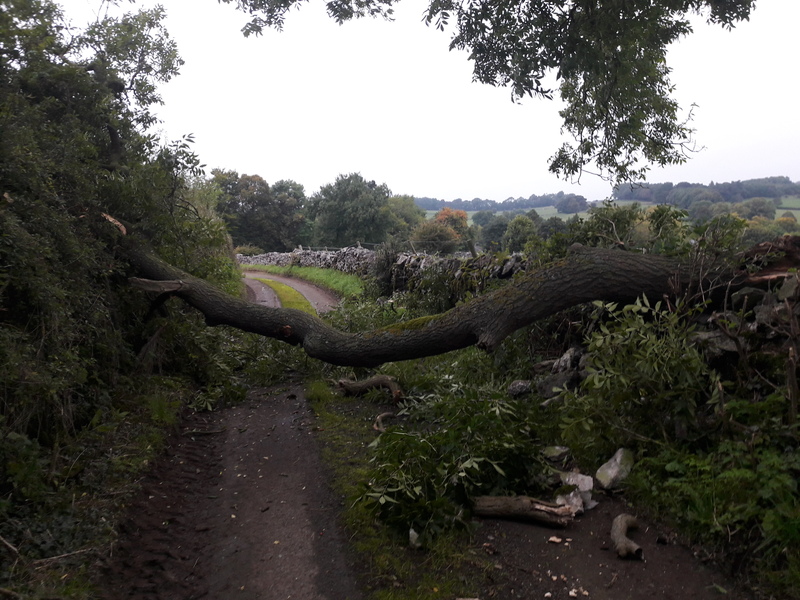 Breezy overnight enough to bring a big branch down on the lane over the BT lines.. At least it will add to the wood stock for next year. Currently light drizzle here and overcast. The early morning drizzle slowly turned to persistent light rain by lunch, Rain stopped around 4pm with sky's slowly breaking now. 4.1C my minimum, but we had rain until16:30hrs and so it was very wet to start off with. Some interesting weather on the way for this evening with gales and heavy rain localy, Warnings have just been put in force by the Meto. Currently dry here with a chilly wind and sunny spells. Blustery with light sometimes moderate rain here with low cloud, Very dull out still got the light on in the kitchen. Edit just eased with sunny spells now and blue sky's above. Heavy driving drizzle here for the past 2 hours. Like sheets moving across the hillsides.